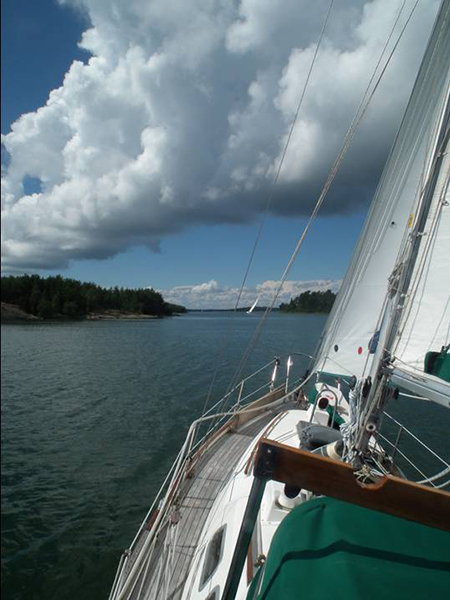 The bare essentials of Finnish sailing - Sail in Finland! So, here I am sailing in Finland again. Well, sort of. Actually I’ve only just arrived in Mariehamn from Sweden and my only experience of Finnish sailing so far has been a very pleasant gentle reach across the Åland sea and a slow run up to Mariehamn’s packed Österhamn (the easter marina of Mariehamn, ed. note). 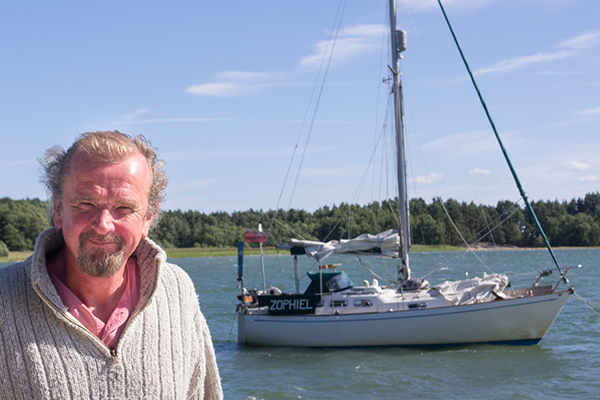 Last year I sailed my long keeled Vancouver 27 ‘Zophiel’ from Scotland to the Baltic via the Netherlands and Germany. I then sailed along the Gulf of Finland to about 100 metres from the Russian border. I made my way back as far as the Netherlands, where I left the boat for the winter. The trip – a total of 3500 miles – was a fantastic one which gave me a taste for more sailing amongst the archipelagos of Finland and Sweden. In order to complete such a long trip I had to zoom rather too quickly through the islands, averaging 40 or 50 miles a day. This year I resolved to take things much more slowly, sailing as opposed to motoring wherever possible, even if at only two knots. I would stop and tie to a rock on whatever island took my fancy and forget about mileage and deadlines. The downside of that policy, of course, is that it has taken me almost 6 weeks to get from the southern end of the Swedish archipelagos to Åland. Now I’m just sitting listening to the rain pattering on the deck and the cool northerly wind whistling in the rigging as it starts to get up to its predicted 12m/s. But I’m not complaining. The weather so far this summer has been so fantastic that even the Scandinavians have only been complaining a little bit that it’s not a proper summer. To someone from the UK it’’s been about as good as a summer gets. To be honest the rain and the wind are making me feel quite at home. It’s pretty standard conditions for sailing on the west coast of Scotland in July. Also, sitting here in the drizzle is affording me the opportunity to study some of my fellow sailors. In particular I’m able to observe and reflect on some of the peculiarities of the Finns in their natural habitat. The most striking thing to a British person about the Finns in summer – apart, of course, from their obvious and inexplicable absolute obsession with saunas – is their footwear. 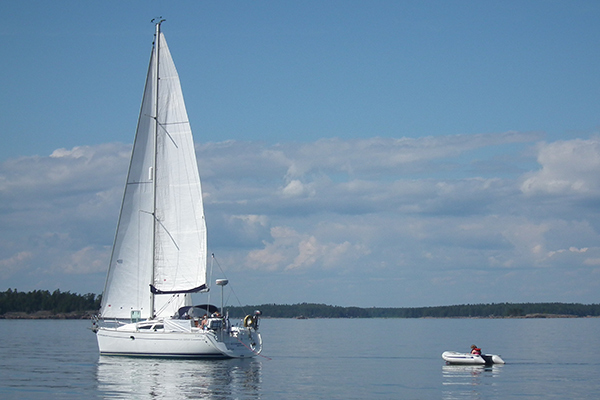 I have tried to explain to people at home in Scotland that in Finland people seem always to sail in bare feet. 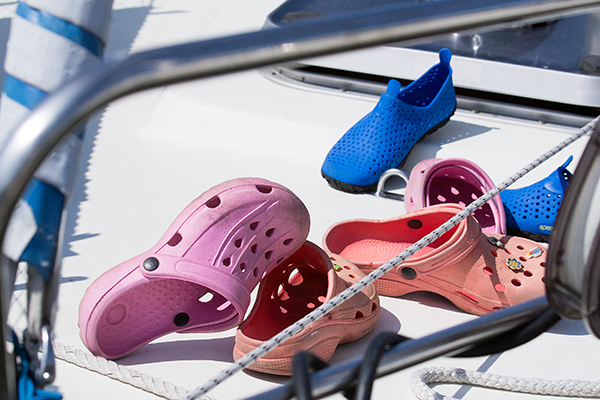 Indeed shoes seem to be banned on board most boats and small piles of them can be seen all along the pontoons. The Scots are absolutely incredulous at this. “What, actual Finland, in the Baltic?” They ask. “Not an island in the Caribbean that’s also called Finland. Why on earth would they sail in bare feet? Surely they would be absolutely bloody freezing. They must be a tough lot, those Vikings”. I explain to them that it’s nothing to do with the Finns’ hardiness or any physiological difference. It’s to do with climate, the nature of the sea and how they have affected the culture of sailing and boating in Finland and the UK. In Scotland most people sail for seven or eight months of the year. Some go sailing all year round and enjoy the odd float about for a couple of hours even in January. At my sailing club near Edinburgh the last Sunday race of the year is usually on about December 20th. That’s not because our climate is particularly good. Rather the opposite. We are quite likely to get a cold, wet July and August. But we might happen to get a spell of good weather in April or October. In Scotland you learn to expect the worst and if you happen to get nice weather it’s a bonus. Therefore the default clothing for sailing is breathable under-layers, thick fleeces, three pairs of thick woolly socks, a thick scarf, a woolly hat, full waterproof salopettes and coat and wellington boots. With luck you get good weather and can peel a layer or two off. Also of course you need to take account of strong tidal currents, harbours – many of which dry out at low tide – which are a long way apart and strong winds and rapidly changing conditions caused by Atlantic lows sweeping over us. So to the Scots, sailing is not a gentle, summer leisure pursuit which everyone can enjoy. It’s more of an adrenalin experience. It’s an adventure for a small number of hardy souls who take the whole thing very seriously. To the Finns it’s much more simple. If it’s not bare feet and shorts weather, it must be the skiing season. It’s certainly not sailing weather. Because here the seasons are so much more defined and obvious than at home. You could visit an anchorage on the west of Scotland in July and it might, on a bad day, be 12 degrees and raining. At the same anchorage on a warmish January day it might be 10 degrees and raining. You’d scarcely be able to tell the difference. In January the water temperature would be about 8 degrees, in July it would be about 13 degrees. Here, on the other hand, the anchorage in July is sweltering in the sun as everyone in Finland who has a boat – which seems to be everyone in Finland – swims in the warm water and barbeques on the hot rocks. The same place in January is a completely different world. White and frozen with, if there’s anyone about at all, people walking or skiing across the bay. The fact that the people of the Baltic inhabit two entirely different worlds – a frozen winter one and a sunny, Mediterranean summer one – is one of the joys of this place. It also gives the Finns a fantastic sense of certainty. If it’s July, it must be bare feet and shorts. I can see a chap out there now, struggling with his dinghy on the foredeck in the rain and the rising wind. He’s got a waterproof sailing coat with the hood up but, of course, bare feet and shorts. Here’s another one. This one really beggars belief. A small speedy motor cruiser has just come into the marina and onto a berth. The middle aged skipper just appeared out of his centrally heated cabin to tie on the lines. In bare feet of course but dressed in what I believe is called in Britain a ‘onesie’. Fluffy, baby blue one piece pyjamas accommodating his ample paunch. Talk about your tough Vikings. Another strange cultural phenomenon to observe is the Finnish treatment of children. 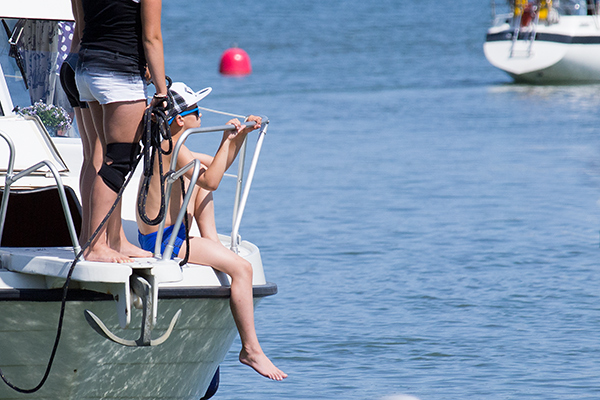 For most parents there seem to be two parts of the boat where children are allowed – right in the bow or right in the stern. The most common place for the sprogs (sprog = child, ed. note) on speedboats – and some sailing boats – seems to be sitting at the bow, bare feet dangling, being battered about mercilessly as the boat crashes through the small waves at about thirty knots. That’s the ‘Bow Sprog’. The other common phenomenon is the ‘Stern Sprog’. Yesterday I saw a baby on a sailing yacht strapped into a seat that was actually suspended well out behind the stern of the boat. I can see the practicalities of this approach, particularly from the perspective of toileting. If you just hang your baby’s bum over the back of the boat it saves all that messy nappy changing. The more usual stern arrangement is for the kids to be towed behind the boat in the dinghy. Sometimes these tows are extraordinarily long. I’ve seen stern sprogs up to about five boat lengths behind the yacht. Presumably this is so that the parents can’t hear their cries of anguish as they beg to be allowed back on board. All of these children, of course, whatever the weather, have bare feet, shorts and huge, thick, all-enveloping, fluorescent orange lifejackets with massive flotation collars. Their parents, meanwhile, are wearing nice, discrete, small, cool automatic lifejackets. It’s not uncommon to see smaller children running around in the sweltering sun, encased in these fluorescent plastic Michelin-Man outfits, up to a kilometre from the nearest water. The sprogs seem to be fitted into the jackets at the end of June and not allowed out again until some time in late August. For an active, jumping, playing toddler in the summer sun it must be a hot, humid, sweaty nightmare inside that fluorescent cocoon. But that’s it! Of course. That explains the Finnish obsession with the sauna in later life. They have been programmed from birth to expect sauna-like conditions all summer, wrapped in plastic. I’m getting a bit harbour-bound here in Mariehamn, but hopefully the weather will improve tomorrow and I can begin my gentle pottering through the Åland and Turku archipelagos. At this rate I don’t suppose I’ll get any further this year.